Full review appeared on Reader's Edyn on 11/18/17 Grace Ellington ... She has been taught quite a lot in healing and now helps others with the skills she has learned. On her way to help a friend with her upcoming birth, she becomes lost in a blizzard and is rescued by Keir. She nurses him back to health following their ordeal, and decides to accompany him to try and improve his nephew’s failing health, but is annoyed when he absconds with her before she even has a chance to reveal her plan to him. Keir holds a fearful reputation, but she sees much more than that within him. While he is indeed in possession of some frightening skills, she can’t help but see all the good in him; having cast judgement prior to discovering his identity. When a dastardly plot is uncovered surrounding the mysterious illness within Dunakin castle, she vows to stay until the traitor is exposed. But another evil exists within the castle and only Grace has the power to save Keir from it. She’s going to save him, or die trying. Keir MacKinnon (Devil of Dunakin Castle) has been bred for evil. The enforcer of Dunakin, his legend spreads far and wide, full of all of the nefarious deeds and deaths he is responsible for. Duty above all else. He used to believe that, but lately he has been questioning the motives behind the wicked actions he is ordered to carry out. He knows there is a better way, but he is torn with what he knows versus what he has done his entire life. Grace is something he never bargained for and sees him in a way no one has ever dared before. She also doesn’t fear him the way others do and they connect on a level he never imagined possible. The Devil doesn’t live happily ever after – a family would be a weakness. After determining the traitor within their walls, he has another punishment to deliver that is causing a war within himself. He knows his orders, but carrying out this particular command will destroy the man inside … Grace is his only hope – and even Keir doesn’t realize just how true that is. This is my first book by Ms. McCollum and it definitely won’t be my last. I absolutely loved this book and the world within. Ms. McCollum took a somewhat familiar plot and then jumbled it all up to give it her own unique spin. I really enjoyed Grace and her uncommon departure from England; choosing instead to remain in Scotland with her sister and take up the craft of healing others. She’s a walking contradiction displaying fear in several instances, but strength in others. I don’t think even at the end, she realized just how strong she truly was. Keir is one of the most endearing characters I have come across in a while. He is the personification of strength – protector of all people and things Dunakin – enforcer of punishments handed down from their leader – a man who understand right and wrong versus necessity and survival – at war with his inner self, knowing his recent punishments have been unjust. He’s pretty much everything an alpha male should be. But his life isn’t his own; ruled by obligation and the decisions handed down from his older brother, Rabbie. Grace walking in to his life was exactly what he needed, having been questioning his role for some time, she helped him see things in a new light. Hard versus soft, They are seemingly opposite in every way, but for them, it works perfectly. This book does a fabulous job of combining two people from different worlds with a bit of mystery and a crazy amount of sexual tension. Grace knows what she wants despite her lack of experience. She’s got a foul mouth on her and every deliciously dirty thing that spills from her lips only makes Keir want her more. She is truly one of a kind with her wanton desires and she isn’t afraid to act on them. Neither is Keir opposed to showing her more about them. Probably my only complaint was the lack of knowledge surrounding Grace’s decision to leave England. There is a bit mentioned about abuse from her brother, but it is never really discussed at length about what happened, or why she didn’t return following his death. Her fear of water is a direct result from him, but she never even discusses that with Keir besides a casual mention about staying away from it. I did quite enjoy watching each character grow and morph into the person they wanted to be. And Keir’s cousin, Brodie is also a brilliant addition to the cast of characters. I’d very much like to see him with his own story; especially given his new responsibilities. Overall, this is a wonderful historical romance with charming characters and an engaging plot that I am thrilled to have been able to read. If all of Ms. Mcollum’s stories are this delightful, then I just might have a new go-to author on my hands. 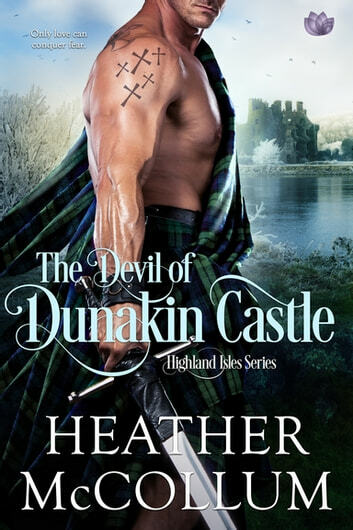 Lovers of HR with a Highland twist are sure to be pleased by this tale of a brooding hero in desperate need of rescuing by his one true match. Kindle version provided by Entangled/Netgalley in exchange for an honest review. I loved it. It's an amazing adventurous read. I think the story is quite thrilling with a hint of mystery. Grace is a lovable character, she is courageous, funny, and has the habit of saying whatever is on her mind. Keir is not bad either. He is living behind the mask of "Devil of Dunakin" but have a kind side which only his closest friend sees, and now Grace can too. Keir saves Grace from wolves and then she saves him from dying. They both feel attracted to each other but there are things that Grace doesn't know about him. To her it's just a grand adventure. To Keir it's a mission to save his nephew. I liked how the story unfolded, not to mention all the characters. Romance part is also quite interesting, both Grace and Keir have explosive chemistry which made it all the more fun to read. I definitely recommend this book if you like historical fiction. Part of a series and was an interesting story continuation. Well written with a novel plot. The hero, bred as an enforcer, is aware his persona strikes fear in others although masks his true character. The heroine urges him to be true to himself and allow their passion to flourish. Each bring out the best in the other.